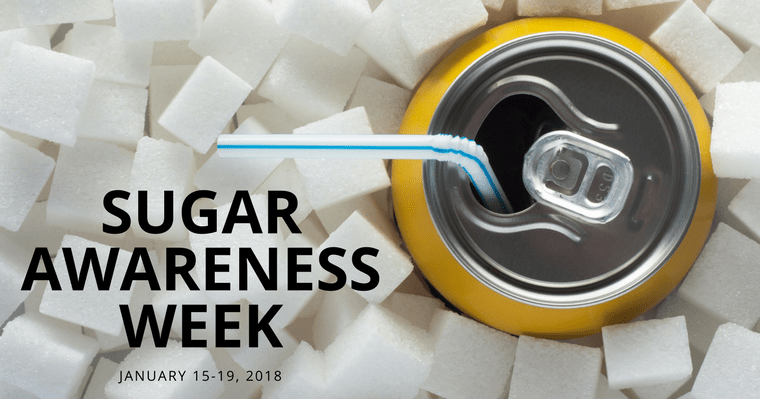 This week is National Sugar Awareness Week. Did you know that excess sugar has negative effects on your oral AND overall health? Let’s talk about your mouth first. Yes, we know that an excess amount of sugar is bad for the waistline, but it also feeds the bacteria living in your oral plaque. If plaque is not removed or disrupted by flossing and brushing daily, the bacterial byproducts lead to tooth decay, gum (periodontal) disease, bad breath, stained teeth, sensitive teeth, and actual tooth loss if the problem is severe enough. It may sound simple, but good basic oral hygiene is the key to good oral health. Expose your teeth to Xylitol five times each day (gum or mints). Xylitol, a sugar substitute, tastes sweet but, unlike sugar, it does not feed the bacteria in your mouth that causes tooth decay. High fructose corn syrup (HFCS) is a potent sweetener that is high in fructose (a powerful sugar) and if avoided, can prevent you from struggling with obesity and other health concerns. HFCS is added to many common foods and drinks because it is a cheap course of sweetener and it has an “addictive” quality about it. Many fast foods are loaded with it. The two most sugar-loaded things to avoid are fruit juices, and soda drinks sweetened with HFCS. Interested and want to learn more? Let’s continue the conversation. Sarah, our Dental Hygienist, enjoys consulting and advising her patients. Make the choice to restore your oral health and a great self-image today by calling The Gorman Center for Fine Dentistry at (651) 483-5134.